Bega Valley has a very high proportion of older people compared to the NSW average and projections indicate that the proportion of older people in our community is increasing. It is also estimated that one fifth of the residents in the Shire have some form of a disability, this is a significant proportion of the population. Council has a key leadership role to play in raising awareness in the community about the needs of older people. working to assist local businesses in complying with the Disability Discrimination Act legislation. Council views these provisions as a response to basic and fundamental human rights and social justice. If you have an issue to raise about ‘Access for all people’ please contact Katrina Berenguer on 6499 2358 or kberenguer@begavalley.nsw.gov.au for further information about the Access Advisory Committee. Find accessible toilets in the Bega Valley Shire: http://www.toiletmap.gov.au. Also available as an App for smart phones. As the population grows older, a new philosophy known as "ageing-in-place" is growing in popularity. Ageing-in-place means embracing home remodels, additions, building styles, and home improvements that make it possible for people to stay in their homes, and out of "the nursing home," as long as possible. Homeowners across Australia are beginning to think ahead and design homes that will allow them to remain independent and at home for as long as possible. Understandably, it would be difficult to find the exact home that will meet your future physical needs; however covering the bases for what most people experience as they age is a good place to start. Regardless of whether you remodel, buy or build, these are possible issues you might want to be mindful of when evaluating the features you want in your home. 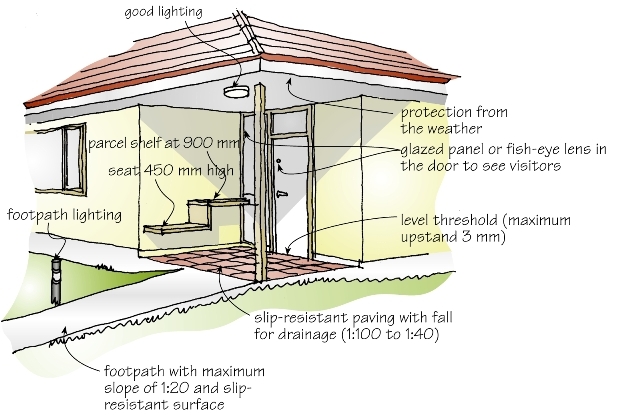 Access to the home should include a step free covered entry with a clear pathway from the street or the garage to the main entry. A clear line of sight to the entry provides safety & security. Movement sensor activated lights give good visibility between all indoor & outdoor living areas. All internal & external doorways and corridors should be wide enough to allow for prams, trolleys, wheelchairs, crutches or walking frames. It is good to have light switches, electrical outlets & thermostat controls in an easy to reach spot for a person sitting or standing. Lever door handles are easier for everyone to use no matter what their age or ability. Reinforcing the walls in the bathroom, shower & toilet makes it easier to install grab rails at a later date if required. Slip-resistant flooring throughout, especially in wet areas such as kitchens, bathrooms & laundries will help to reduce the risk of injury & falls. Kitchens with an open floor plan provide good access for everyone. Where possible install adjustable shelving & pull-out storage drawers. Lever handles on all taps will allow them to be used with minimum force. Sufficient floor space in bathrooms & toilets & level entry to the shower recess allow access for everyone. A hand held, height adjustable showerhead is easy for people sitting or standing. Include cabling & outlet points in all rooms throughout the home for future integrated electronic control & communication systems, such as: telephone, television, security & internet, plus the possible need for tele-care at a later date. It’s a good idea to consider the possibility of extra space near internal stairs for later installation of a lift or stair-climber if needed.